As the United Nations Conference on Trade and Development (UNCTAD) celebrates its fiftieth anniversary, business and government leaders from across the world gathered this week in Geneva for the biennial World Investment Forum (WIF). The UNCTAD-sponsored four-day event brought together policymakers, investors, and development professionals as well as representatives of academia, research centres, and non-governmental organisations. The forum, now in its fourth edition, aims to offer stakeholders a venue to present ideas, showcase opportunities, and swap experiences. This year, the forum focused on sustainable development and poverty reduction in general and more particularly on how to encourage the private sector to take an active role in defining the United Nations post-2015 development agenda of sustainable development goals (SDGs). UNCTAD Secretary-General Mukhisa Kituyi noted in his opening speech that investors are becoming increasingly aware of the opportunities awaiting them in developing countries. These countries, in turn, are now more conscious than ever of the need for providing the legal and economic frameworks required by investors. “More is being done to attract investment and ensure it makes a positive impact on societies,” said Mr Kituyi. Recognised as one of the world’s premier events that offers a platform for the setting of development policies at the highest level, the WIF also aims to promote an inclusive dialogue on best practices. Minister of Economic Affairs Al Mansouri of the United Arab Emirates went to Geneva to share insights into his country’s push towards sustainability and economic diversification. The forum was divided in over forty separate events, including ministerial roundtables, mini-summits, and sessions on a wide range of topics related to the financing of sustainable development initiatives. In its World Investment Report 2014, UNCTAD concluded that $3.9tn are needed annually to attain sustainable development goals. Current levels of investment cover barely a third of the funds required to banish abject poverty from the world. So far, no solution has been found to bridge the $2.5tn annual funding gap. Though many ideas were presented and initiatives proposed, the leaders gathered in Geneva failed to produce a coherent plan to address the issue. Though that may indeed not have been the idea behind the forum, a concerted global effort is needed to up investment streams to the required level. According to UNCTAD calculations, large private corporations have in excess of $5tn available for investment. This pile of cash is currently sitting on the side lines – or lying idle on balance sheets – awaiting assignment to projects. Though these funds are not moving yet, the mere idea of unlocking this vast store of investment capital has an increasing number of countries scrambling to update legislation in order to become more investor-minded and friendly. Thus, the idle trillions are already causing progress by convincing both governments and private parties to clean up their acts and get serious. The result of these subtle, yet profound, changes were on full display in Geneva. While the talk was all about sustainable investment, most conversations – both on and off stage – soon veered off in the direction of governance and its importance as a core driver of sustainable development. While widely recognising that significant progress on improving governance standards has already taken place, most WIF participants readily agreed that much remains to be done – not just by the corporates, but by governments as well. In its 2014 Trade and Development Report, UNCTAD researchers concluded that greater policymaking flexibility is required if the global development goals of the post-2015 agenda are to be met. Meanwhile, stock exchanges – and to a slightly lesser extend their regulators – have taken the lead in the dissemination of governance best practices. In Africa, the Johannesburg Stock Exchange pioneered innovative listing and reporting requirements that encourages private companies to focus on good governance as part of a broader push to sustainability that also includes environmental and social considerations. The example set by JSE has since been followed by the Egypt Stock Exchange, a founding member of the Sustainable Stock Exchanges (SSE) Initiative, and more recently by the Nigeria Stock Exchange (NSE). The Egypt Stock Exchange in particular has been a relentless advocate of sustainability as a prime driver of economic growth. 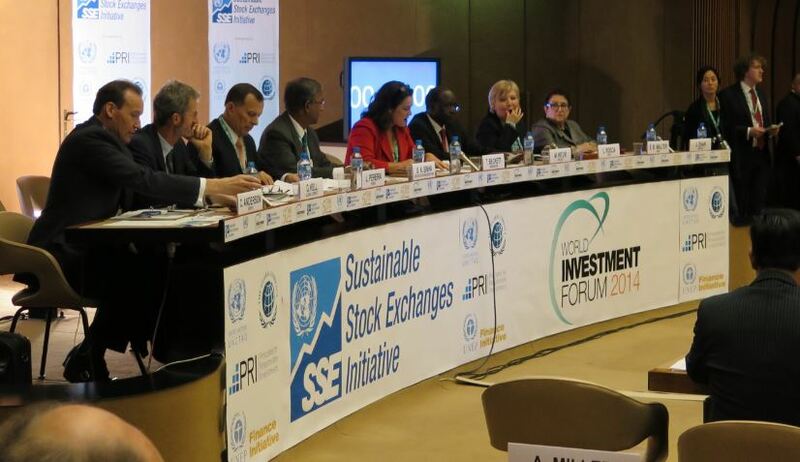 EGX Executive-Chairman Mohammed Omran delivered a passionate plea at the 4th SSE Global Dialogue on Tuesday in Geneva and called on all and sundry to embrace ESG (environmental, social, and governance) values to facilitate and boost wealth creation via stock exchanges. Mr Omran said companies embracing corporate sustainability principles have fared much better on the trading floor of his exchange than those that so far have not changed course. A similar experience was reported from Lagos where the Nigerian Stock Exchange is working on a number of initiatives to further governance best practices amongst the 223 listed companies. According to NSE CEO Oscar Onyema a recent pilot project has shown that corporations willing to improve governance standards may expect their stock to outpace the average index by up to 300%. While issues remain and standardised metrics for measuring ESG performance are lacking, most delegates came away from the forum convinced that the vectors of development are now set: sustainable development is no longer merely a catchword, but an increasingly well-defined set of principles to empower all stakeholders as progress is made towards a more equitable world.